BEIJING - Local officials in China's western Xinjiang region held a public rally for the mass sentencing of criminals on Tuesday, handing out judgments for 55 people and at least three death sentences for crimes such as "violent terrorism," state media said. 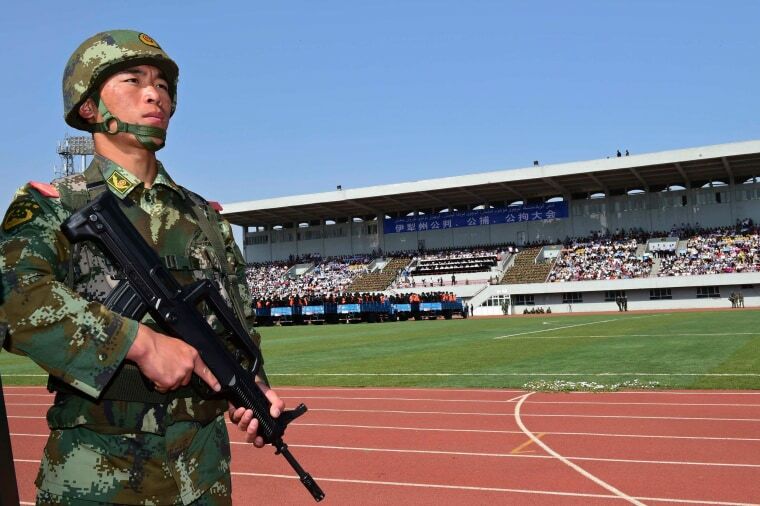 Photos showed packed stadium bleachers and trucks parked on the sports field loaded with prisoners in orange vests being guarded by armed police. The mass trial follows a similar event last week in the region where 39 people were sentenced to jail on terrorism charges. China is waging a year-long anti-terrorism operation nationwide after a series of attacks, but has focused on Xinjiang, home to a large Muslim Uighur minority, following a series of bloody attacks that Beijing blames on Islamists and separatists from the region. The latest prisoners were sentenced for a range of crimes, including intentional murder, separatism, and leading or participating in terrorism groups, People.cn, the website associated with the ruling Communist Party mouthpiece, the People's Daily, said on Tuesday night. The public sentencing made clear the determination of the ruling Communist Party to strike hard at "violent terrorism, separatism and religious extremism," the prefecture's deputy Party secretary Li Minghui said at the rally. The public spectacle was originally reported by the official Xinhua news agency, but links to the story appeared to have been taken down. China has said five suicide bombers carried out an attack at a morning vegetable market in Xinjiang's capital of Urumqi on Thursday, which killed 39 people and injured 94. It was the second attack in Urumqi in just over three weeks. Beijing says separatist groups in Xinjiang are seeking to form their own state called East Turkestan. Exiles and rights groups say the real cause of the unrest is China's repressive policies that put curbs on Islam and the culture of Uighurs, Muslims who speak a Turkic language.